Split by the sacred Yamuna River, Mathura's claim to fame is being the birthplace of Krishna, the widely revered Hindu god. On the 20th (Sat), contemplate in the serene atmosphere at Krishna Janmabhoomi Mandir, take in the spiritual surroundings of Sri Krishna Janmasthan, then take in the awesome beauty at Govardhan Hill, then contemplate in the serene atmosphere at Keshavdeo Temple, and finally contemplate in the serene atmosphere at Dwarkadhish Temple. For other places to visit, where to stay, maps, and other tourist information, refer to the Mathura driving holiday planner . 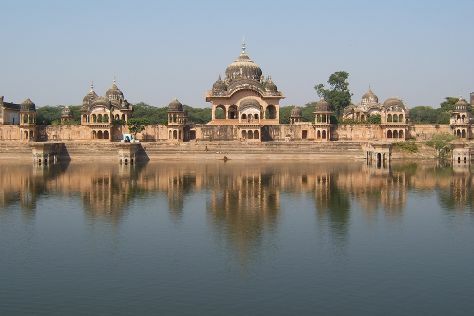 New Delhi to Mathura is an approximately 4.5-hour car ride. In April, daytime highs in Mathura are 44°C, while nighttime lows are 24°C. Finish your sightseeing early on the 21st (Sun) so you can drive to Vrindavan. The holy town of Vrindavan marks the place where the Hindu deity Krishna is said to have spent his childhood. 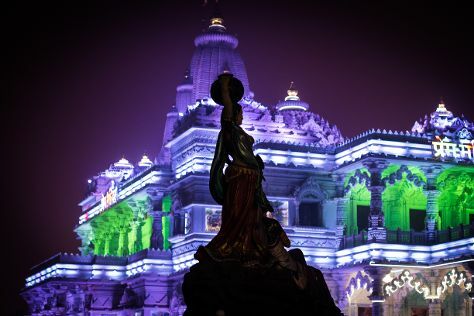 On the 21st (Sun), contemplate in the serene atmosphere at Prem Mandir - Shyama Shyam Dham, then contemplate in the serene atmosphere at ISKCON Vrindavan, then contemplate in the serene atmosphere at Bankebihari Temple, and finally contemplate in the serene atmosphere at Banke Bihari Temple. For photos, ratings, other places to visit, and tourist information, read our Vrindavan trip itinerary builder . Vrindavan is very close to Mathura. Traveling from Mathura in April, you can expect nighttime temperatures to be a bit warmer in Vrindavan, with lows of 29°C. Wrap up your sightseeing on the 21st (Sun) to allow time to travel back home.